(From left) Prof. Yaa Ntiamoa-Biadu,Mary-Ann Acolatse, Mrs Kudom-Agyemang and Audrey Gadzekpo. Communication Consultant in Environmental, Science and Climate Change Ama Kudom-Agyemang, has called on journalists to increase their reportage on issues concerning climate change and environment. The veteran journalist admitted that though reportage on climate change and environment had gone up over the years, more has to be done. 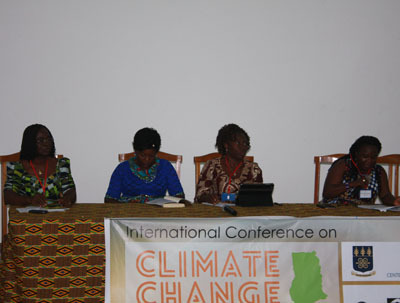 Mrs Kudom-Agyemang who was speaking at International Conference on Climate Change and National Development held at the University of Ghana(UG), Legon in Accra said reports regarding climate change if carried out effectively would inform the general public and go a long way to help the nation. “In the last couple of years, we say reportage on climate change has gone up because there are a lot of training activities going on for Journalists. Our reporting in this country, it is mostly event based but with climate change stories, you need to sit down, come up with a plan, get and issue that which is relevant to climate change and how they are affecting ordinary people . If we are able to do this then I will say we are doing our work better,” she said. She disclosed that if the public is properly informed on issues regarding climate change and environment, people would stop associating man-made disasters to climate change. Commenting on the series of floods that have been hitting the country, Mrs Kudom-Agyemang noted the country needs to have structures in place to prevent the disasters rather than blaming them on climate change. Director of Next Generation of African Academics at UG, Prof. Yaa Ntiamoa-Biadu said journalists and scientists in the field of climate change and environment needed to work together in order to communicate its negatives and positives to the public. The conference was mainly to strengthen the climate courses in the university level and strengthen capacity for research, climate change and food security, health as well as water resources.